Ok, so this is probably the coolest thing I have ever posted. The lovely Ashley Martinez contacted me a few months ago about her gorgeous line of nail polish that just happened to be inspired by The Star-Crossed Series!!!!! First of all, I was floored. Honestly, and so humbled. How sweet, right!! I was actually driving when I got the email. Well, ok, I wasn't driving, but I was in the car. So I had to wait for hours before I could actually check out the polishes and then when I could finally pull up the pictures I was giddy with excitement. Not only is the idea of Indie-Nail-Polish one of the coolest things I've ever heard, BUT the colors and concepts are fantastic. I'm all about treating my body like a temple. And I've gone to a lot of lengths to give my family healthy options for food, beauty products and in whatever other ways I can. We don't even use a microwave for goodness sakes. But nail polish? I had never really thought about it. Until I started reading about Indie Polish. I mean seriously?? It's something I ALWAYS wear and allow my girls to wear. But let's be real about the factories nail polish is produced in and how chemically poisoned it has to be. So I just HAD to share this with all of you! 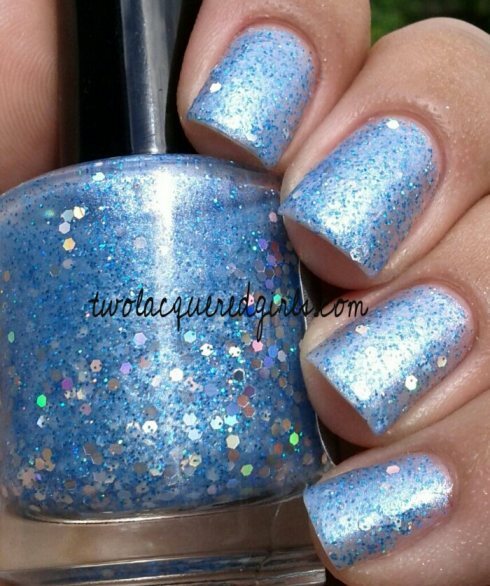 "The Forever Magic Indie Nail Polish line is based off the books by Rachel Higginson, The Star-Crossed series. Reckless Magic, Hopeless Magic, Fearless Magic, & Endless Magic. I became totally inspired by these books and had to make some polish based off them. Now it is my best selling collection and I have gotten a lot of people to read these books. There are a total of 8 polishes in the collection. I did my best to make them match the books and go with the stories. They are based off what I imaged in the books and how it was explained by Rachel’s writings." So cool, right??? Ok, now let me introduce you to the fab colors! Crown Me!- Crown me is a polished packed with gold shapes. Ashley with gold shapes to show the fight for the crown. 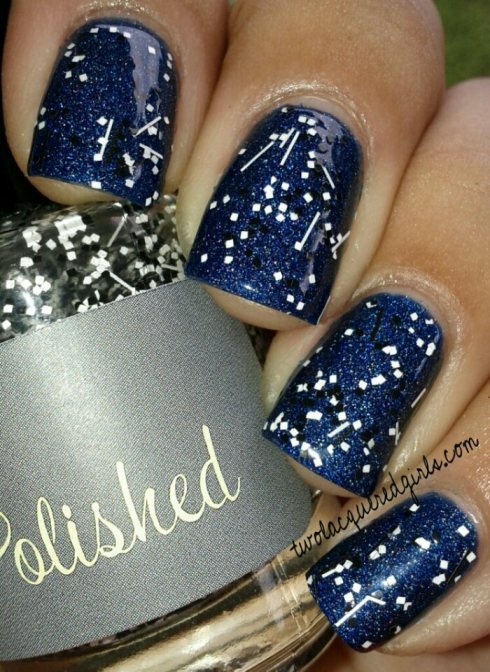 This polish gives off a royal look when wearing. This one is based off all the books. The whole point of the series was to appoint the crown to its rightful heir. Mixing Magic- (Limited Edition) This is a white polish packed with blue, gold & pink dust with sliver holographic squares. I based this polish on how no one is allowed to mix their magic unless royal. Ashley wanted to show how beautiful it would be if they would all be able to mix there magic and make their whole world stronger. She added all the dust to show how pretty life would be for them if able to love who they wanted and mix their magic. Then she added the holographic squares to show extra glamor. Star-Crossed Lovers- This polish is just for the series name. Ashley had to go with that. This polish shows the strong love Eden and Kiran have for each other. 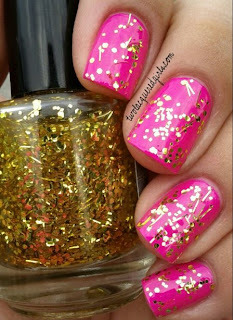 The polish itself is very simple unike there love life. 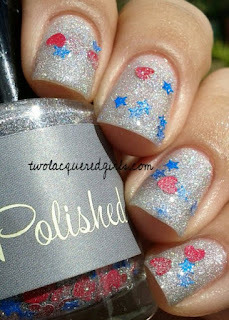 Sliver holographic dust with added red hearts and blue stars. Eden- The Star! Ashley just had to go with the star of the book. She added all black shapes to this polish to match her hair and eyes, and then added sliver holographic shreds to it because all shreds are one of a kind & beautiful just like Eden herself. 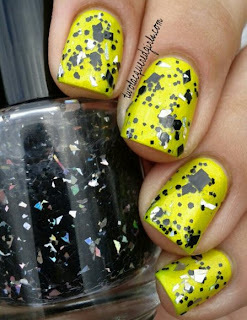 Twin Connection- A simple polish packed with black and white shapes. This polish is based off the twin connection between Eden & Avalon. Two people the same but different just like black and white on the color wheel. Looks great over any color. 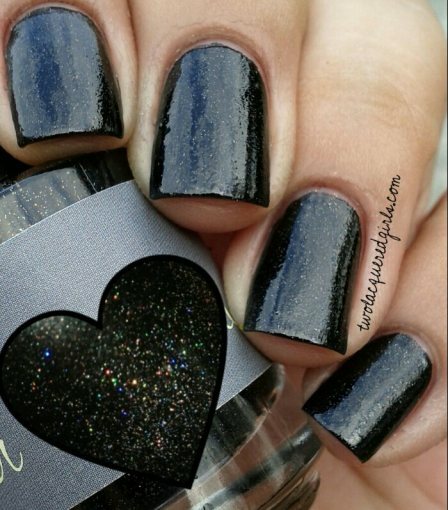 Kiran’s Ocean Eyes- This polish features Kiran's eyes because you always find Eden getting lost in them. She explains them as if she is looking in to an ocean. So Ashley went with a baby blue base for the polish and added different blue glitter to show depth like an ocean. Then she added sliver holographic hexes because his eyes have that shine and the color need it. 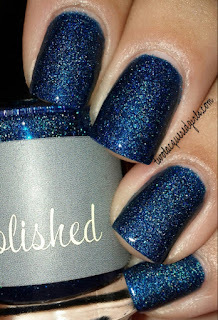 Last Battle- (Limited Edition) This polish is based off the final battle against Lucan in the last book Endless Magic. Ashley did a black base polish with holographic dust to show, “the light at the end of the tunnel”. It was always there just had to fight to get to it. The copper dust is to show the fight that everyone in the kingdom put up to defeat Lucan. Blue Smoke- (Limited Edition & Best Seller) The blue healing smoke that no one has a name for. Eden got it from the caves in India. This is a holographic polish. Dark blue to show the smoke and Ashley added the holographic to show the strength that the smoke has and for how mesmerizing it is to everyone. And the best part is all polish is handmade and 3-FREE! Meaning it is free of harmful chemicals. Thanks Ashley for letting me feature your shop!!! And for being so inspired by Eden and Kiran!!! was available in South Africa! I would love to have them!!! They are gorgeous!!! Never would have thought of series inspired nail polish, but I LOVE it. I'm getting at least one of each, this is awesome! !